When we think of writers, we normally think of those who craft creative fiction — short stories, poems, novels, maybe even dramas or screenplays. One key to successful writing, however, is the ability to write in multiple forms and for a variety of purposes. At WriteAtHome, we believe it’s important to expose developing writers to a wide spectrum of writing modes or purposes. Even if they eventually specialize in a particular type of writing, there is great benefit in learning to write broadly. 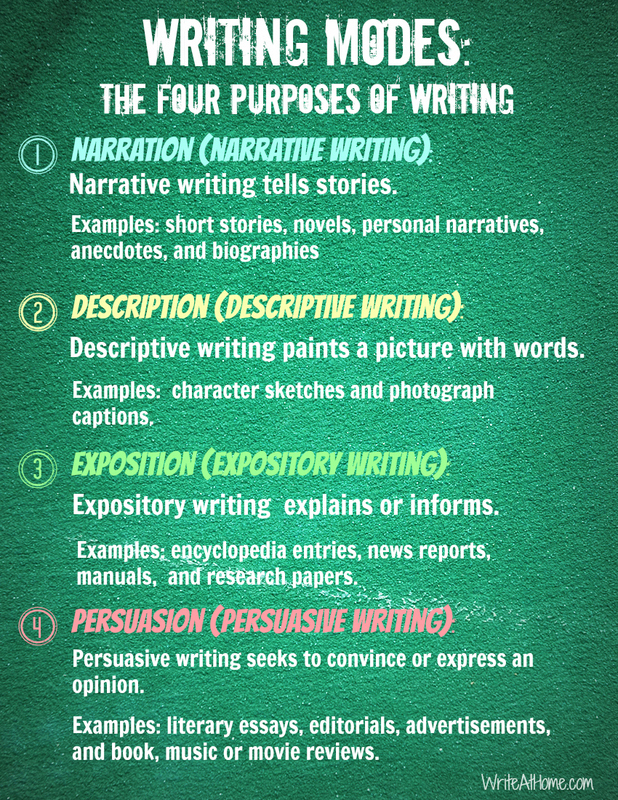 Below is an overview of the basic purposes for writing. In a future article we will look at various forms of writing. Update: I have added a poster and a printable PDF of this material — see below. Feel free to download, print, share, or pin! 1Narration (narrative writing): Narration is story telling. In many ways it is the easiest kind of writing because it comes so naturally to most people. Practically everyone enjoys telling and hearing stories. Narratives usually progress chronologically, and must have a clear beginning, middle and end. Short stories, novels, personal narratives, anecdotes, and biographies are all examples of narrative writing. 2Description (descriptive writing): Think of description as painting a picture with words. Of course, when you use words, you can paint more than what you see, but also what you feel, hear, smell and taste. The idea of description is to make the thing described seem real to your reader’s imagination. Not much writing is purely descriptive; writers typically weave description into longer narrative works. Some essentially descriptive writing, however, might include certain forms of advertising, character sketches, and photograph captions. 3Exposition (expository writing): Exposition is writing that explains or informs. It is a practical kind of writing (the kind you are reading right now!). Examples of expository writing include encyclopedia entries, news reports, instruction manuals, informative essays, and research papers. 4Persuasion (persuasive writing): Persuasive writing seeks to convince the reader of a particular position or opinion. Persuasive writing is in many ways the most difficult to do well because it requires knowledge of the subject, strong convictions, logical thinking, and technical skill. Some examples of persuasive writing include literary essays, editorials, advertisements, and book, music or movie reviews. 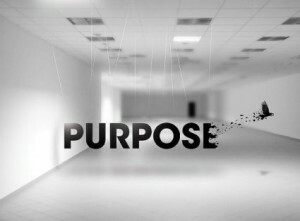 Other purposes for writing certainly exist, and more specific sub-purposes can exist within these four categories. You may write to pass an English class, to express your feelings to a loved one, to get your money back on a disappointing purchase, or to remind your brother to take out the trash. Still, just about any kind of writing imaginable fits into one or more of these four categories, and strong writers master the techniques and strategies required for each. We love comments! Leave yours below. Brian, in the old days, many textbooks presented three purposes: inform, entertain, and persuade. This was sort of a taxonomy for student writing. Most of the “modes” will work under the three divisions. For example, narrative sometimes entertains, informs, and persuades…Huckleberry Finn might be an example. It informs us about “boyhood” and good times on the Mississippi, but also comments on the historical moment in satirical way. It is also persuasive in dealing with the satirical targets. Moreover, there are lots of chuckles as Huck comes of age. Nevertheless, you might make case if you were careful about presenting your paradigm. Keep on keeping on. You may have the small end of a big idea.